FreeBitco.in Reviews - Legit or Scam? FreeBitco.in Reviews – Legit or Scam? FreeBitco.in is the online home of FreeBitcoin, a company that says they want to give people an opportunity to win Bitcoin just by playing games, and at no cost to themselves. For people who aren’t familiar with Bitcoin, it is a special type of digital “cryptocurrency” which means that it doesn’t have any physical existence. Instead, it exists entirely online and is used in a peer-to-peer, or person-to-person format. Their website says that Bitcoin is being accepted by more and more businesses and retailers each day, and even has a way of growing in value over time as market trends change, just like any other world currency. The goal of FreeBitco.in is to give people who are either new or beginners to this currency a way to begin earning and investing it completely for free, with the simple act of playing a game. This website begins by telling people they will give them the chance to “win free Bitcoins every hour.” Each hour, their members will have an opportunity to play a “simple game” where they can win up to $200 in free Bitcoins. Once you begin wining your currency, you will be given a second opportunity to multiple your Bitcoins by playing a “Hi-Lo” game that they say has been “designed to be provably fair by using a combination of math and cryptography.” Customers can win up to one Bitcoin each time they play. Members are also asked to refer their friends and family members to this website to participate in the games as well. Whenever someone you refer plays the games on their websites, you will automatically receive 50% of whatever they win. 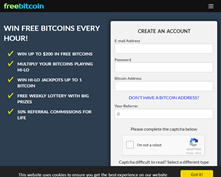 Finally, they also provide members with an option to play a weekly lottery for which you will be given free tickets whenever you or someone you have referred plays their free Bitcoin game. Certainly Bitcoin is a real type of currency that has been popular for awhile and has been considered a potentially good investment depending on who you listen to. The fact that this website deals in Bitcoin does not create an issue with its legitimacy. The most significant problem with this website is the sheer lack of information it provides. While they spend a lot of time and effort explaining Bitcoin, how it works, and how it is valued to their potential customers, they spend almost no time at all explaining to their customers how their “game” works and why it results in them giving you free Bitcoin. Just like with any other money making opportunity on the internet, a company that isn’t willing to tell you where or how your money is being made is a company that simply should not be trusted. Average Rating for " FreeBitco.in Reviews " is 2.33 out of 5 based on 9 reviews. Customer Service does not exist for starters. In their FAQ's they state they do not respond to emails if the questions have been addressed in the FAQ's. This is a lie as they do not respond to anything. They even ignore legitimate complaints. My account was hacked and the account balance was lost and they did nothing, nor did they offer to do anything. They will let you win small wagers but if you increase the bet to say 5000 satoshis I watched the numbers spin and spin as if it was resetting itself and I lost hand after hand yet the games are provably fair and you have a 47.50% chance of winning. Lottery winners are reserved to their highest bettors and depositors. Due to aggressive attacks to their reputation their lottery has went from several bitcoin to less than a half a coin. There are a couple other faucets that are much better. Contact me for details. your are right... my satoshi vanished from my account itself, it was around 15000. i m stopping working here. My personal experience with this site is good. Of course the chances of getting a big prize are little, so this is why a lot of people are loosing their satoshi easily. I am get all my rewards, in every roll, and I got pass 30000 satoshi some months ago. At the present time I am getting my daily interest for the amount I keep in my account and I' m getting payed everyday. I also had the chance to withdraw my satoshi with no problems and worked perfectly. So, my final and sincere evaluation: totally legit and honest. Reached a small # of 700 Satoshi and my IP is somehow blocked.....Used VPN, but it's the same. Oh well, thankfully it's been only a week. I even tried to refer people lol. This anticipate Freebitco turning into scam. Any one have completed 30000 Bit coins and tried to withdraw on bank account, Kindly Share, Thanks. it is totally fake. when i reached the minimum no of bitcoins to be withdrawn then it says timer is running even you are not playing the reason being the same IP being used by other user which is not..Total scam and fake...never beleive it..